I had some time to kill and wanted to bake, but I didn’t have many ingredients in my house. Quite an embarrassing admission from someone who loves to bake, but I hope to remedy that problem sometime this week. 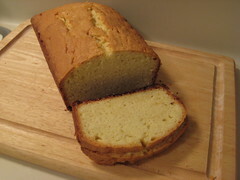 Anyway, after sorting through recipe after recipe, I decided on a pound cake. Well, I’m sad to say that once again, I’m disappointed by a Dorie recipe. The cake’s flavor is good, but it’s way too dry and crumbly. At first I thought I may have done something wrong, but after reading other people’s reviews, I’m not alone. Have no fear though, there are more Dorie recipes to be tried! Center a rack in the oven and preheat oven to 325 degrees F. Butter a 9×5-inch loaf pan or an 8 ½ x 4 ½ -inch loaf pan. Put the pan on an insulated baking sheet or two regular baking sheets stacked on top of each other. Working with a stand mixer, preferably fitted with a paddle attachment, or with a hand mixer in a large bowl, beat the butter and sugar on high speed until pale and fluffy, a full 5 minutes. Scrape down the bowl and beater and reduce the mixer speed to medium. Add the eggs one at a time, beating for 1 to 2 minutes after each egg goes in. As you’re working, scrape down the bowl and beaters often. Mix in the vanilla extract. Reduce the mixer speed to low and add the flour, mixing only until it is incorporated – don’t overmix. In fact, you might want to fold in the last of the flour, even all of it, by hand with a rubber spatula. Scrape the batter into the buttered pan and smooth the top. Put the cake into the oven to bake, and check on it after about 45 minutes. If it’s browning too quickly, cover it loosely with a foil tent. If you’re using a 9×5-inch pan, you’ll need to bake the cake for 70 to 75 minutes; the smaller pan needs about 90 minutes. The cake is properly baked when a thin knife inserted deep into the center comes out clean. My notes: I used cake flour and the 9×5-inch pan. Recipe from Baking: From My Home To Yours by Dorie Greenspan. Didn’t you read my review lol? Yes, this was disappointing. Although I will say it was actually a bit better several days after I made it. I’m sorry to hear that – I’ve been thinking of making this cake too. Good to know your opinion about it. Paula, I remembered reading that AFTER I tasted it. Of course. I’m sad that Dorie has disappointed me yet again. one of the biggest disappointments in life is smelling something SO GOOD in the oven, and then tasting it and being let down. how can something that smells so good not be THAT good? what causes a sad streak in a pound cake?